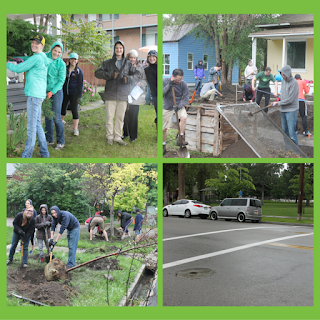 Saturday’s rain didn’t keep over 130 people from participating in the Timp Neighborhood Beautification Day. Shannon Bingham, Timp Neighborhood Chair, organized the event as a matching grant project through Provo City’s Neighborhood Program. Volunteers from the neighborhood and members of the YSA 16th Stake of the Church of Jesus Christ of Latter-day Saints braved the downpour to clean yards, remove dead trees, remove debris, and plant trees. With the assistance of Dalton McArthur they also installed three irrigation systems. Everyone was wet, but barely noticed as they worked diligently to accomplish their tasks. Children helped in any way they could, including bringing water to those who were working. The project began with a “walk-the-block” meeting where neighborhood residents, City Council members, and some City staff walked the area together to see what could be done to help the neighborhood. Once the needs were identified, Bingham worked with Louise Jorgensen, Council Executive Office Assistant, to apply for the matching grant. Jorgensen coordinates the matching grants, service projects, and walk-the-blocks as part of the Neighborhood Program. 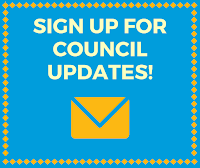 Matching grant funds are provided by Council to match donations and volunteer hours as part of approved neighborhood projects. Provo City also installed a crosswalk to cross 500 North at North Park to improve safety for those in the neighborhood trying to get to the park or Provo Recreation Center. Approximately 408 service hours were put in, along with donations to carry out the project. Habitat for Humanity brought in their tool trailer, providing the needed tools to accomplish the project. Donations to the project came from Fresh Market, Smith’s Food and Drug, and the City of Provo. Bingham explained her motivation for this project, "Our family has lived in the Timpanogos neighborhood for 16 years. We love the walkability of our downtown neighborhood with parks, recreation center, schools, library, grocery stores, Center Street activities, and so much more within blocks of our home. We love the character of older homes and the established trees that come with them. Through sixteen years of work on our own home and yard improvement projects we know how much time, energy, and expense this takes. We love our neighbors and wanted to add a lift to the spirits of everyone with a neighborhood wide improvement project. Through neighborhood matching grants and a group of over 200 volunteers we were able to help with some sprinkler systems in neighbors yards, remove dead trees, plant new trees, clean up yards, prepare garden areas, and more. This project showed us the good in humanity through volunteerism, along with the long term effects of adding beauty to our neighborhood. Most important of all strengthening relationships and building community together."